The museum’s award-winning digital projection Waves of migration returns this Sunday, Australia Day, to once again illuminate the museum’s iconic roofline with a rich tapestry of migration stories drawn from our collection. Waves of migration explores the history of migration to Australia and the compelling stories of those who’ve come across the seas – from British convicts and early settlers, to Jewish refugees and displaced persons; from post-war European migrants and Ten Pound Poms, to Indochinese boat people and seaborne asylum seekers from Afghanistan. This year we have added an emotional new chapter about refugee artist Gina Sinozich, who fled Istria, Croatia (in the former Yugoslavia), in 1956 and arrived in Australia with her family in 1957. 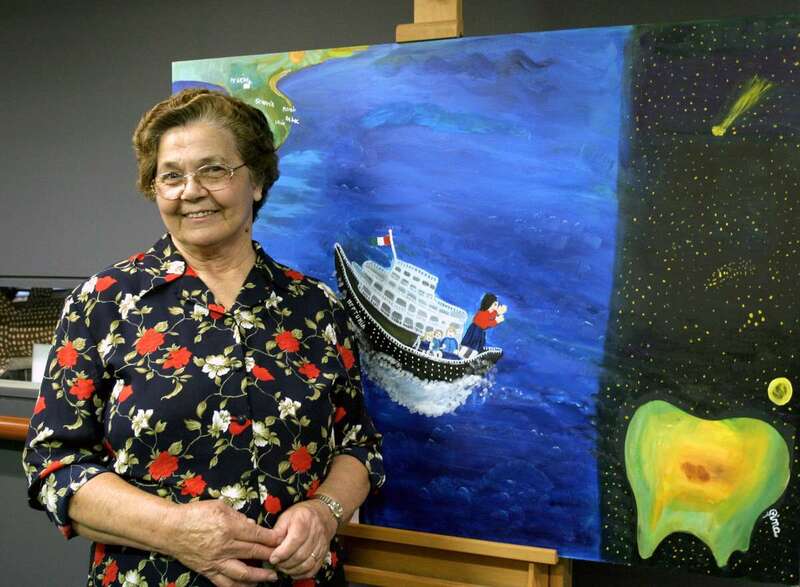 Incredibly Gina only started painting in 2000 – when she 70 years old. Her husband had been diagnosed with dementia and she recognised the urgent need to capture her memories of their life together and their family’s journey to Australia on Neptunia. The museum holds an evocative collection of Gina’s work, which has provided rich inspiration for the new scene. One of the things that resonates most about Gina’s story is that she was never able to say goodbye to her mother, mother-in-law, best friend and brother. She couldn’t tell her loved ones of her escape plan, for fear of repercussions from the strict communist regime, and this memory haunted her for years. Gina came to terms with this in one of her most poignant and powerful paintings, Our precious things we left behind, by creating an imagined farewell to her loved ones on a rain-swept wharf. 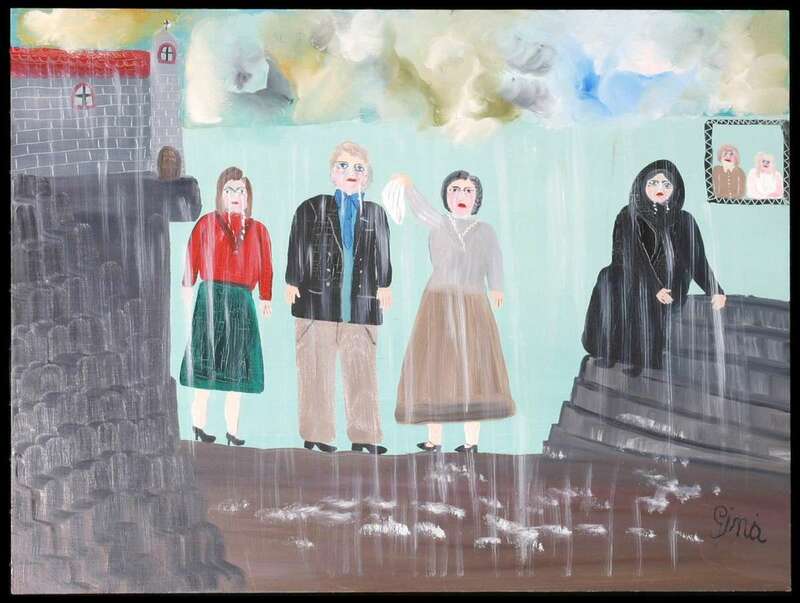 The new scene in Waves of migration illustrates this story beautifully as her imagined farewell transforms into a painted farewell – giving tangible form to memory in Gina’s wonderfully unique style. You can read more about Gina’s story at Waves of Migration. 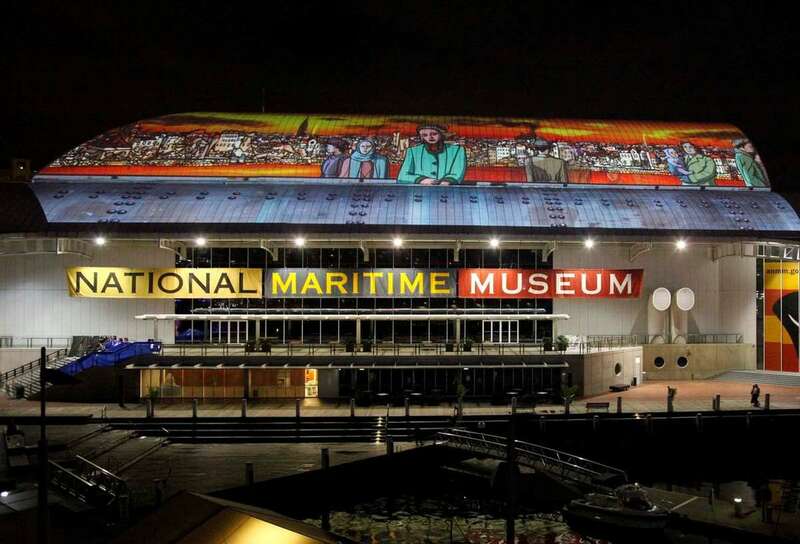 Waves of migration will be projected on the roof of the museum from Australia Day, 26 January, running nightly after dark until 13 February 2014. The best vantage point is Pyrmont Bridge in Darling Harbour, from where you can also hear the new specially-commissioned soundtrack that weaves the show together and dramatically captures elements of hope and fear, courage and adventure, grief and triumph – the universal emotions associated with Australia’s waves of migration. Kim is the curator of post-Federation immigration at the Australian National Maritime Museum.